Do I Annoy My Co-Workers? Take the Quiz and See. I’m so excited, I finally did it. I created an annoying quiz just for you! With 100% certainty I know what is going to happen to you in the coming weeks. 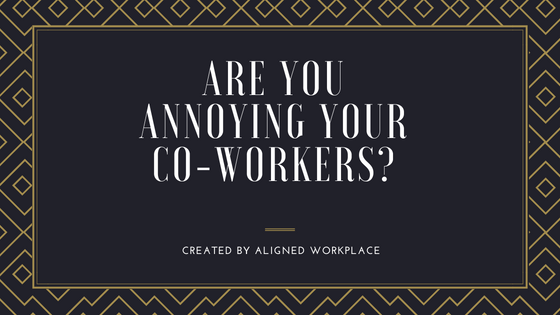 You will annoy a co-worker. Usually not purposeful, but the end result is the same. It gets in the way of the work. Although we often don’t intend to offend, it happens. We don’t always look at our behaviors or understand our actions that annoyed our colleagues. Who wants to spend their time being annoyed? That’s annoying already. My new quiz will provide insight into how your co-workers interpret your actions. With 50% certainty, I know you are going to struggle with honesty when taking the quiz. When the words resonate, pick that answer or you will only be annoying yourself. Aligned Workplace mentors business leaders and managers to drive their agenda and build workplaces where success, inspiration, kindness, and joy define the culture. We provide specific actionable advice to put you on the path to being less annoyed at work by using tactics to instantly transform the relationship dynamic. Because being annoyed takes away from you driving your business agenda and wastes your time. First step is to know your “annoying type.” — the quiz will help you. 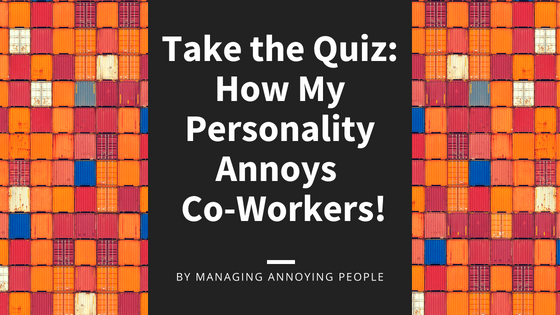 Start the quiz and in 7 questions you will know your annoying personality type. Take the advice and share, share, share your results. The world wants to know: What is your annoying workplace personality?